Kartago kaj ties dependaĵoj en 264 a.K. Ruinoj de Kartago (termobanejo Antoninus Pius). Kartago (Qart-ḥadašt "nova urbo") estis la Fenicia urboŝtato de Kartago kaj dum la 7a al la 3a jarcentoj a.K., inkludis en ties influsferon la teritoriojn de la Kartaga Imperio. Tiu imperio etendis super multo de la marbordo de Nordafriko same kiel enhavis grandajn partojn de marborda Iberio kaj la insulojn de okcidenta Mediteranea Maro. Kartago estis fondita en 814 a.K. Dependaĵo de la fenicia ŝtato de Tiro dekomence, Kartago akiris sendependon ĉikaŭ 650 a.K. kaj establis sian politikan hegemonion super aliaj feniciaj setlejoj tra la okcidento de la Mediteraneo, kio daŭris ĝis la fino de la 3a jarcento a.K. Je la pinto de sia hegemonio la urbo iĝis ĉefa kerno de komerco, kaj ties komercejoj etendis tra la tuta regiono. Dum multo de sia historio, Kartago estis malamika de la Grekoj en Sicilio kaj kun la Romia Respubliko, kio kondukis al serio de militoj konataj kiel Grek-Punikaj Militoj (ĉ. 600–265 a.K.) kaj la Punikaj Militoj (264–146 a.K.) respektive. La urbo ankaŭ devis zorgi pri eblaj minacoj de malamikaj Berberoj, nome la indiĝenaj loĝantoj de la areo kie Kartago estis konstruita. En 146 a.K., post la tria kaj fina Punika Milito, romiaj fortoj detruis, redesegnis, kaj poste okupis Kartagon. Preskaŭ ĉiu el la aliaj feniciaj urboŝtatoj kaj iamaj kartagaj dependaĵoj poste falis en Romiaj manoj. ↑ Brett Mulligan. (2015) Cornelius Nepos, Life of Hannibal: Latin Texts, Notes, Maps, Illustrations and Vocabulary. Cambridge: Open Book Publishers. “Archaeological evidence confirms that Phoenician traders from Tyre founded the city of Qart-Ḥadašt—or "New City," as Carthage was known in its native language—in the second half of the ninth century BC.”. ↑ Glenn Markoe. (2000) Phoenicians. University of California Press. ISBN 978-0-520-22614-2. ↑ Sabatino Moscati. (12a de Januaro 2001) “Colonization of the Mediterranean”, Sabatino Moscati: The Phoenicians. I.B.Tauris. ISBN 978-1-85043-533-4. ↑ Maria Eugenia Aubet (2008)Political and Economic Implications of the New Phoenician Chronologies. Universidad Pompeu Fabra. Alirita 24a de Februaro 2013. 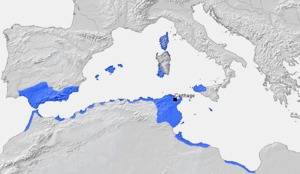 “The recent radiocarbon dates from the earliest levels in Carthage situate the founding of this Tyrian colony in the years 835–800 cal BC, which coincides with the dates handed down by Flavius Josephus and Timeus for the founding of the city.”. ↑ John Iliffe. (13a de Aŭgusto 2007) Africans: The History of a Continent. Cambridge University Press. ISBN 978-1-139-46424-6. ↑ H.H. Scullard. (1a de Septembro 2010) From the Gracchi to Nero: A History of Rome 133 BC to AD 68. Taylor & Francis. ISBN 978-0-415-58488-3. Ĉi tiu paĝo estis lastafoje redaktita je 06:24, 8 jan. 2018.